Before reading about digestive system problems in chickens, it is helpful to understand how the digestive system works. Hens don’t have teeth of course so the way they digest their food is completely different to mammals. 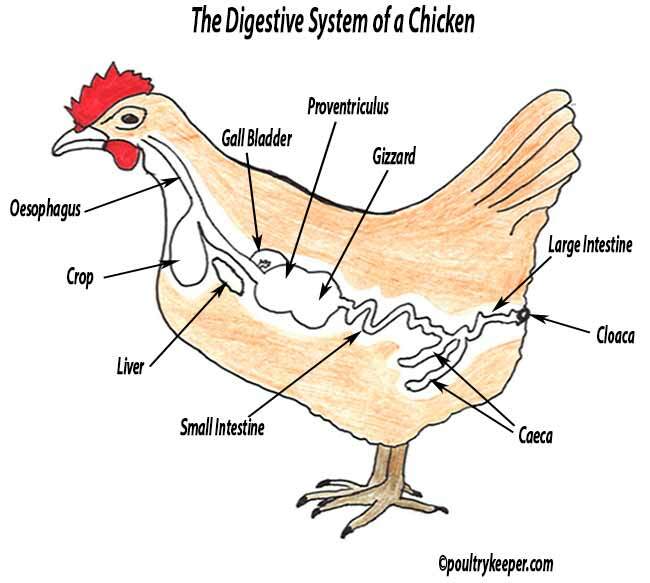 A simplified diagram of the digestive system of a chicken. The digestive system of a chicken mechanically and chemically breaks down food and allows nutrients to be absorbed ready for use in the body. It is important to understand how the digestive system works in order to get a better idea of digestive system problems and to know what is normal (like a bulging crop or the caecal discharge). The main problems that we encounter as hobby poultry keepers in the digestive system are worms and crop problems such as impacted crop / sour crop. The beak moistens food with Saliva. Food is not chewed. The oesophagus takes the food down to the crop to be stored. After a chicken has eaten, the crop will feel full and bulge. Food from the crop slowly passes down to the proventriculus. The proventriculus mixes the food with acids and digestive enzymes. Food is then passed through to the gizzard where insoluble (flint) grit has accumulated. Food is ground down by strong muscular action in the gizzard. From the gizzard, food is passed through to the small intestine and is reduced further with enzymes from the pancreas. Bile produced by the liver and stored in the gall bladder helps to break down fat. The intestines digest the food, taking nutrients from it. Water and the remaining undigested food is absorbed in the large intestine. The caeca are a pair of tubes that allow fermentation of undigested food to take place. This is emptied every 24 hours or so and is a light brown (mustard colour) froth. This can often be confused as diarrhoea by the novice. The cloaca / vent passes a combination of faeces and urine, together with eggs from the oviduct.